Exhibition catalogue, Retrovision: Peter Phillips paintings 1960-1982, Liverpool, Walker Art Gallery, 1982, pp. 18-19. M. Livingstone, POP ART: A Continuing History, London, 1990, p. 98. London, Royal College of Art, RBA Galleries, Young Contemporaries, February - March 1961, no. 143. Peter Phillips was born in Birmingham, where he attended the College of Art (1955-59). He then went on to study at the Royal College of Art in London (1959-62) alongside David Hockney, R.B. Kitaj, Patrick Caulfield and Allen Jones. He did transfer from the Painting to the Television School in 1961 due to disagreements with his teachers but in due course received a Diploma in Painting in 1962. His early work was strongly influenced by American painters and his canvases were filled with Pop imagery. 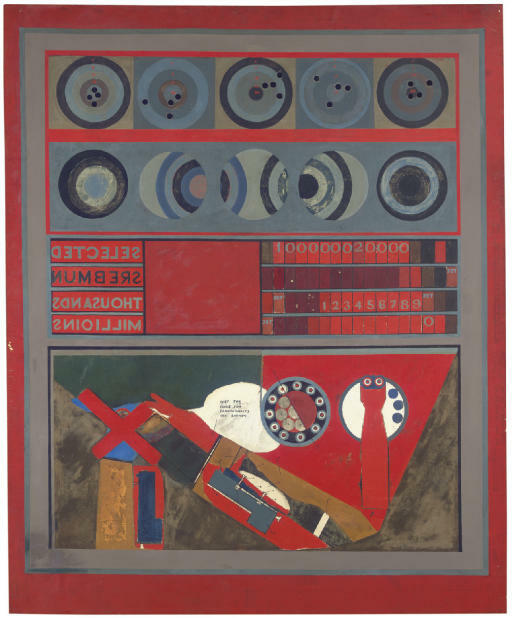 Marco Livingstone comments, 'One Five Times/Sharp Shooter 1960, painted immediately after Purple Flag, carries further not only the amusement arcade imagery but also the principles of conscious disruption and of intuitive juxtapositions of images from unrelated sources: a row of targets with actual holes punched in them, a grip of selected numbers, a diagrammatic representation of a sleeve pistol, and what appears to be a hare, half-obscured by a cancellation mark, muttering the curious phrase, 'JUST THE THING FOR TAXIDERMISTS AND BATMEN' (see exhibition catalogue, Retrovision: Peter Phillips paintings 1960-1982, loc. cit. ).